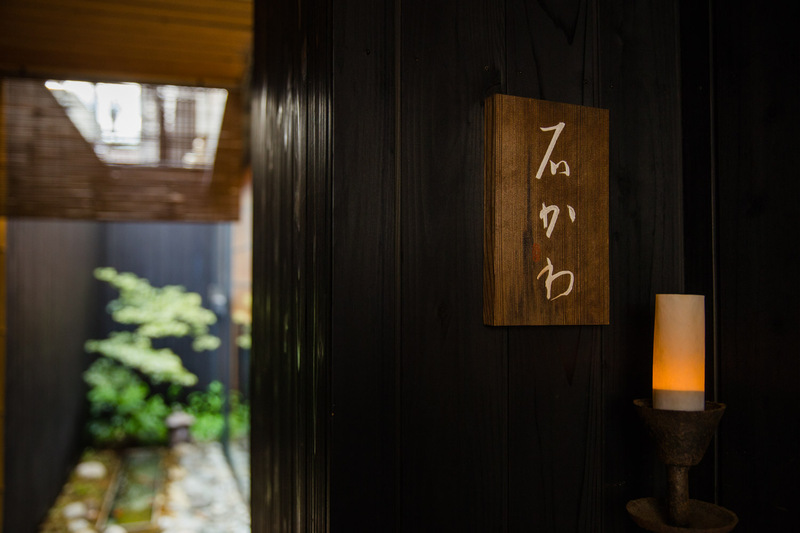 Steeped in Japanese aesthetics and hospitality, Kagurazaka Ishikawa interlaces seasons, produce and space for a perfectly relaxing and memorable dinner. With a beaming smile to welcome you, this three-star Michelin kaiseki cuisine is created from a place of great warmth and love. 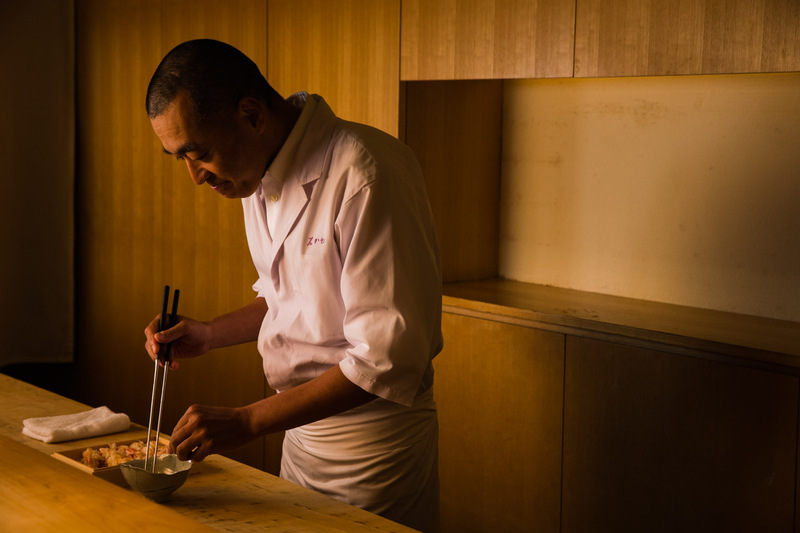 Chef Ishikawa’s own career has been filled with hardship, but deep love for his staff and guests drives the passion that can be savored in every delicious bite. Tucked behind Bishamon Temple down a small street of Kagurazaka, turn from the narrow laneway to find a dark wooden passage. The stone path has been purified with water for your arrival, according to Shinto traditions. 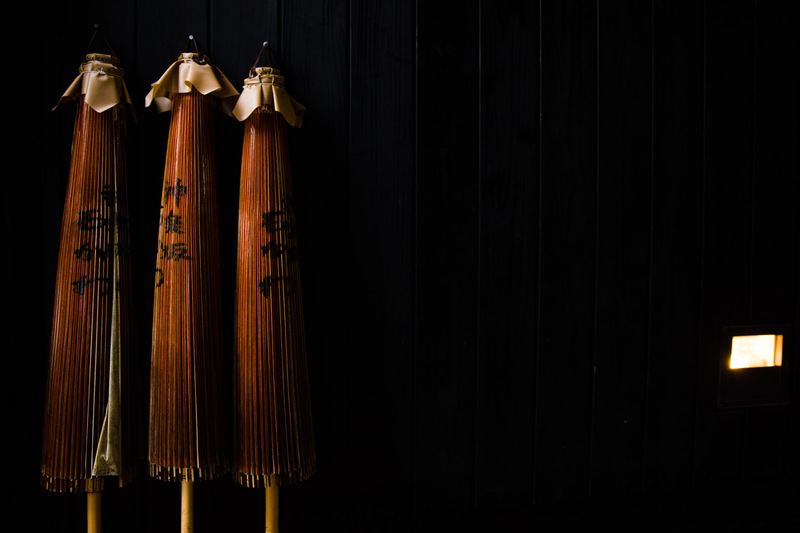 Adorned in dark calligraphy ink with the characters for ‘Kagurazaka Ishikawa’, traditional umbrellas hang ready to assist guests in the event of a downpour, the first of many touches showing that at Ishikawa, the customers comfort is paramount. In a sunken pond, brilliant red fish swim happily amongst stones and moss. Behind it stands a small maple which turns a similar shade of brilliant red come autumn, greeting you with a sense of the season before you even open the door. Large glass windows softened by bamboo shades lead through to a wooden interior in a warm mix of black and pale varnished timber. A small alcove in the wall of the dining room holds a miniature shrine. 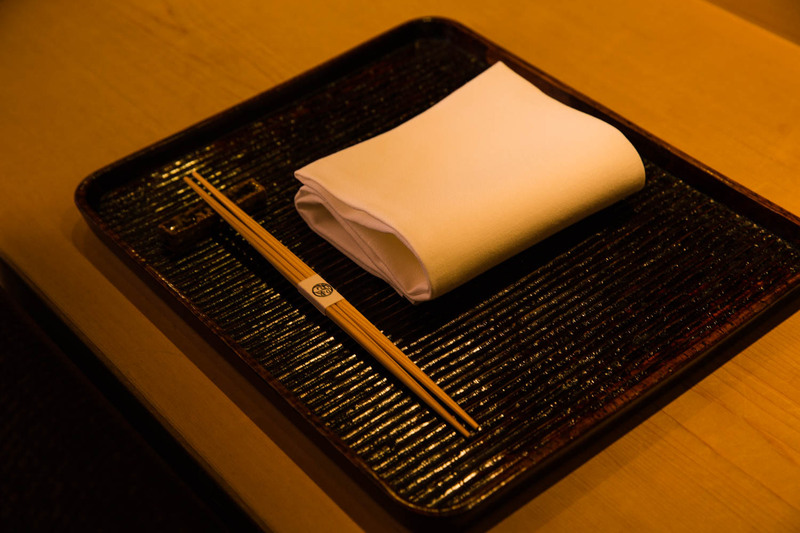 Whether you are seated at the counter or in one of the private rooms seating up to six guests, you will find before you a ridged lacquerware tray with a soft white folded napkin and a pair of chopsticks. The setting may be simple but the dinner that follows will stay with you forever. With playful touches on traditional Japanese cuisine, there is always a new twist to enjoy during dinner at Ishikawa. The dishes walk on the edge of simplicity, and yet there is something that makes you stop and contemplate. How can you be so surprised on the palate by something that appears like a dish you have had before? That’s the hook that brings guests back time and again. Drawing on all his experiences, Ishikawa process the whirlwind of thoughts and creativity in his mind and settles them into cuisine with intense clarity. Refreshing and cooling dishes in summer make way for deliciously warming dishes in winter, with the perfect mix for all the seasons in between. Simmered, grilled, or seared, in crisp tempura, or the bare flesh of sashimi – every dish showcases both the quality of the produce and the chef’s incredible skills. The meal is completed with piping hot rice cooked with seasonal ingredients in an earthenware pot – the aromas and textures are such that almost no one can resist having seconds! Ishikawa sources all his ingredients locally. He focuses on using familiar ingredients you may find anywhere in Japan, but puts his own special spin on it. During preparation for the evening meal, he works sincerely but in a lighthearted manner, and you can almost imagine him whistling if no one was around. Here he stands at his counter, and he appears to be in his element. When Hideki Ishikawa greets you with his warm and welcoming smile, standing behind the counter preparing food with meticulous precision, you would never believe that as a young adult he was poor at conversation and had no interest in the culinary world. In fact, the eventual motivation to become a chef came from a false assumption that the chef can stay safely in the kitchen, shielded from conversations with guests. 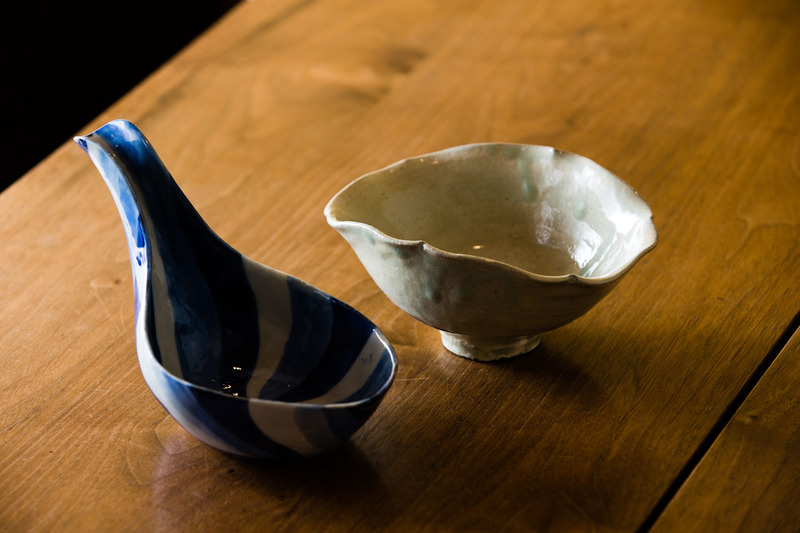 After high school, Ishikawa joined a western tableware wholesaler in his home prefecture of Niigata, but his private relationship turned sour and he left to find something new. Sleeping on a friend’s couch in Tokyo, he spent two years picking up odd jobs, working at a café/bar. He moved into a three–tatami mat apartment with no bath and a shared toilet, and with very little money, dining out was a luxury he could never afford. On the road to nowhere in particular, he had to find a better way to live. With permed hair and clad in the latest fashion, he knocked on the door at a popular Japanese restaurant in Harajuku. Turned away in an instant, he cleaned up his image, knocked again and was given a job. He worked wherever his new boss sent him, gaining experience with chefs at restaurants around Tokyo. He felt genuinely looked after despite the at times grueling training, and it was the years under the chef of Kamiya when the passion for cuisine took hold. 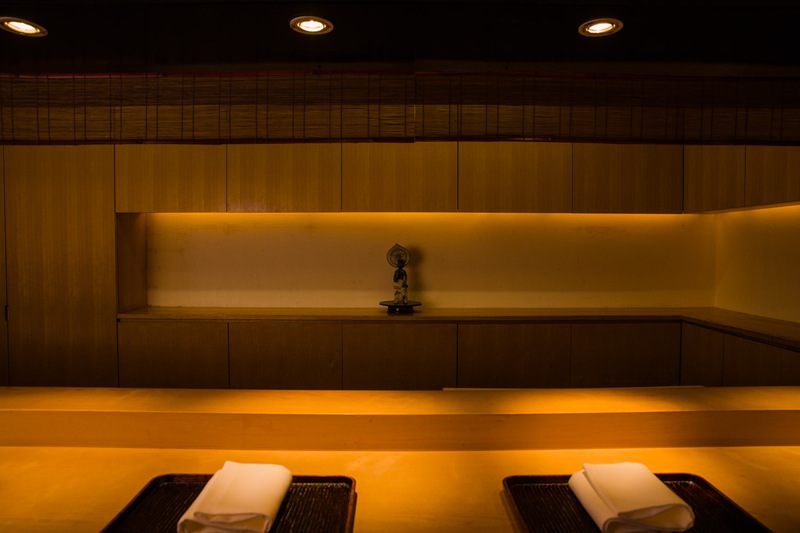 He gave up everything to focus on cooking, immersing himself in Japanese culture through tea ceremony and ikebana and studying tableware, exposed to the best of the best through his master. At the age of 35, Ishikawa was put in charge of the counter for the first time in his career. At Okazaki in Yaesu near Tokyo Station, he experienced for the first time the deep satisfaction in seeing customer responses first-hand, enjoying their reactions, learning from their hesitations, and making adjustments on the go. Throughout all his trials, Ishikawa’s biggest lesson has been the importance of personal connections and treating people well. He certainly implements that now that he is in charge. The wellbeing and happiness of the people around him – be they staff or his guests – constitute his greatest goals. Ishikawa still calls himself a novice, but those around him very much see him as a leader. His sincere approach, drawing on all his experiences to arrive the unique flair seen in his cuisine, his desire to constantly evolve and progress, and his warmhearted character are an inspiration to all who meet him. 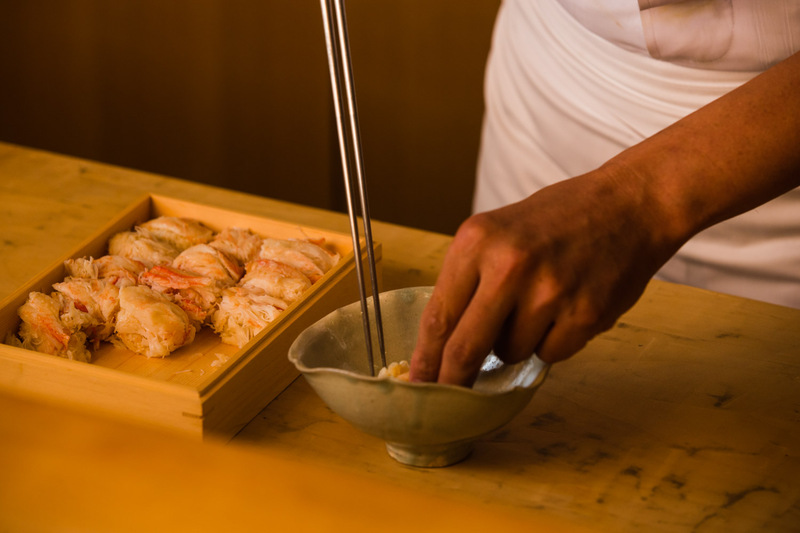 While Ishikawa wholeheartedly welcomes the idea of his cuisine being enjoyed the world over and is constantly looking to evolve, this does not imply a desire to expand overseas. As the executive chef of the Ishikawa group, which also includes the three-star Kohaku and two-star Ren, both in Kagurazaka, he likes to look at the big picture. He feels there is so much to be gained from working as a team, and his biggest goal is to serve as an inspiration to other young chefs, presenting them with opportunities to springboard into their own careers. 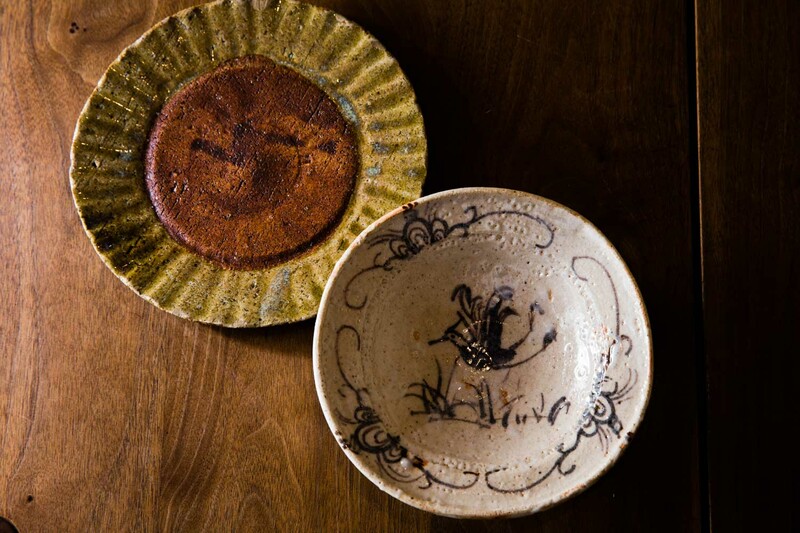 Ishikawa’s tableware collection has been purchased through galleries or especially for the restaurant through conversations with the artists directly. Chef Ishikawa enjoys the surprise of handmade pottery as you never know how it will turn out until it emerges from the kiln. Notably, Ishikawa holds several decorated ceramics by the multi-talented artist Rosanjin, who was himself known as a gourmand. During design he thought deeply about the relationship between a dish and the food that would be served on it. The broad collection also includes jaw-dropping antique pieces from Ming Dynasty China; pieces from modern artists like Go Ikenishi; and Shino and Oribe ware by Emiko Takigawa characterized by thick white glazes with red scorch marks, and a green cooper glaze, respectively. Most of the pieces are a reflection of the forest greens, caramel browns, bold charcoal tones and sandy cream colors found in nature.